Sheng Shiuh Metal Co., Ltd. was founded in 1986, as a manufacturer and exporter, specialized in cash boxes, our factory is located in Chang-Hua, central Taiwan, and has nearly 5,000 square meter of floor space to accommodate the office, factory and warehouse. 1. Metal stamping div. : for steel sheet forming. 2. Painting div. : with automatic powder-coating system. 3. Assembly div. : to assemble and pack products. 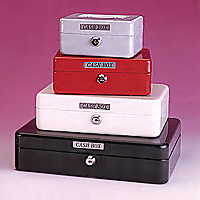 There are three major kinds of products: PORTABLE CASH BOX, SAVING BANK and KEY CABINET. Portable cash box and saving bank can be a gift and stationery. Key cabinet can be a tool to keep work and life efficient and convenient. We constantly and actively develop new models for our product line. After knowing our methods of fabrication you can consider that our products are suitable to your market. If you need further information of our products, please do not hesitate to contact us. our products, please let me know in anytime.